for example, knowing the difference between a period and an exclamation point can change the meaning of a sentence. 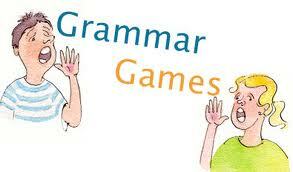 Make learning grammar an enjoyable process by using games as a tool for teaching the subject. Use sports-themed games as a way to reinforce knowledge of the parts of speech. Write words that illustrate different parts of speech on index cards; adjectives, verbs and nouns, for example. For a game of basketball, set up a wastepaper basket, show a word to a student and if the student can properly identify the part of speech, she can try to toss a ball into the wastepaper basket. You could also play a game of parts of speech soccer, in which students must identify the part of speech written on a card and if they are able to do so, they may try to kick a ball into a goal. Students earn a point for identifying the part of speech and another point if they make a basket or a goal. The student with the most points at the end of the game wins. Engage your students in an editing races. Divide the class into groups of two or three students. Print a sentence on the board that contains grammatical errors, including punctuation marks and capitalization. Have students observe the sentences and the first pair or group to correctly edit the sentence wins the round. The group or pair that wins the most rounds of the game wins the entire game. Another option for an editing race would be to write sentences on the board that contain grammatical errors. Have one student from each team edit an individual sentence and the team that correctly edits all sentences first wins the game. -- create different cards for each student. State a part of speech and if a child has a word that contains the part of speech, she should mark it off. For example, if you say "pronoun" and a child has the word "New York" on her card, she should mark it off. The first child to mark off a vertical, horizontal or diagonal line wins the game. Another table game that can be used to teach grammar is memory. Print different types of sentences on one set of index cards and print the names of different types of sentences on another set of cards. For example, write a declarative sentence on one card and the word "declaration" on another. Children must flip over the cards and match the written sentences to the types of sentences. Have children identify the parts of speech in texts. Provide students with photocopies of pages from books, as well as different colored highlighters. Assign a specific color highlighter to a part of speech and have children read through the text and highlight the words using the correct colored highlighter. The first child to complete the task wins. Another option for this activity is to have students make lists that indicate the different parts of speech from the photocopied pages. For example, children can create lists of nouns, verbs and adverbs. The child who identifies the most words from the parts of speech wins the game.